First we viewed a completed scheme of 8 family homes in Bishop Thornton which are now all sold before heading to Ripon where they are building 6 detached houses with sweeping views over the Harrogate countryside. We asked Jonathan a few questions about his experience with Close Brothers and the market in general. When did your relationship with Close Brothers begin? My dad first had a facility with Close Brothers about 25 years ago, he started building new houses a year or so before this, with borrowing from a local bank. Prior to building new homes my dad worked with his brothers as building contractors and worked for their father before that. We can trace our ancestors back 7 generations of builders in the local area, back to stone masons for the rural estates. In the mid 90's dad was experiencing difficulties with his previous lender and was referred to Close Brothers in 1994, we have borrowed from them ever since, building new residential houses. How do you see your business and brand developing in the future? We seem to have found a bit of a niche now with the properties we build, high end/high quality homes with the best finish we can. We build traditionally in terms of quality material and finish with a modern ethos internally especially in terms of a 'fabric first' approach to insulating the homes. 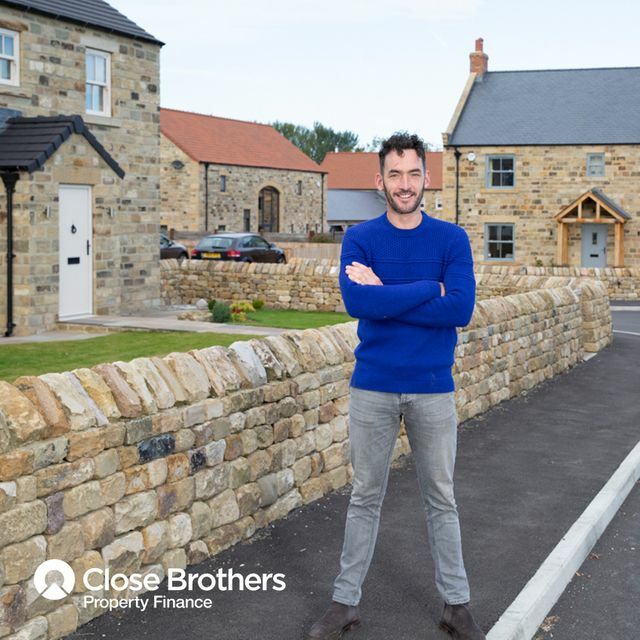 We want the properties to be individual and bespoke, but to blend seamlessly into our local area in the North East. My family and I all live locally and our subcontractors are all local lads who understand our product, helping us to maintain this standard in the future. We want to keep going as we are, building one site at a time of between 6 and 16 houses. The last scheme we undertook near Harrogate of 8 houses took us about 18 months from start to finish, and this scale seems to suit us. How many projects have you completed with funding from Close Brothers and what is your relationship like? Maybe 80 houses in total, we are doing more now than historically but we don’t want to stretch to more than one project at any time as we like to keep the quality of what we do. Our relationship with Close Brothers is really good, the bankers are trustworthy, reliable and funds are made available straight away. The service is brilliant, above what you’d expect nowadays. We have the mobile phone numbers for the bank managers and can access them anytime, even at the weekend sometimes like the old-fashioned service you used to hear about. Are you facing any challenges at the moment on site or with the market in general? Sales have been good lately, the biggest challenge going forward is in respect of a skills shortage in the building industry. There is a shortage of highly skilled workman, especially the younger guys. I’ve been on site with my dad since I was 13, I’m in my late 30’s now and I’m still one of the youngest on site. It’s hard work on a building site, the winter weather and heavy lifting I think puts people off. The property market is notoriously up and down, it has peaks and troughs and Brexit is just another one. A lot of buyers we deal with are fairly financially secure, we’re not selling masses of stock with large mortgages as our target market is far more niche, so it seems ok so far. Would you have any advice for new developers/SME's starting out? Just have a go, but be wise. I’ve been doing this for almost 20 years, learning all the time and even when times are hard, if you have a good product to sell people will buy it. The reliability of funding can be an issue, investors can offer large chunks of capital but half way through a project can run out. So a big part of Close Brothers for us is their reliability, you know your funds are coming. Once the loan facility is agreed you are absolutely sure you can get on with it. A big part of Close Brothers for us is that reliability, you know your funds are coming. Once the loan facility is agreed you are absolutely sure you can get on with it.